Vegetable oils are best known for cooking and baking. Let us know some other creative uses of these oils. Continue reading to find out what they are..
• Coat the gaskets of car doors with vegetable oil to avoid freezing shuts during winter months. • You can clear tars, bird droppings and old stickers on your vehicles by applying cooking oil on to the surface. Allow the oil to stay for 15 minutes and clean with soap and water. • Make your sticky lock go easy by putting the key in the vegetable oil for some time. Wipe of the excess and put the key in the lock and slowly turn it from side to side to loosen the lock. • Dip a rag in a vegetable oil and to lubricate, door hinges, gliders and window locks. • Dab little vegetable oil on your tools to prevent rusting. • Rubbing vegetable oil on leather gloves will take away the stiffness. • Vegetable oil can be used to clean wooden cutting boards and wooden utensils. Just dab some oil on paper towel and rub on the surface. • Use vegetable oil to remove price stickers on utensils by soaking it for ten minutes and then peel it off. • Vegetable oil is a wonderful cleaning agent for pearls. Dab little oil on your pearls and wipe it off with a clean soft cloth. • Apply little vegetable oil on the wrinkles around your eyes. It works as a good moisturizer. • If you face problem with dry and cracked heels, apply little vegetable oil on it. Cover your feet with a clean pair of cotton soaks before you go to bed. You'll wake up in the morning to see your soft feet. You can also use on your hands and cuticles also. • It can be used as a shaving cream, if you run out of it. You also get a bonus of silky smooth skin after your shave. 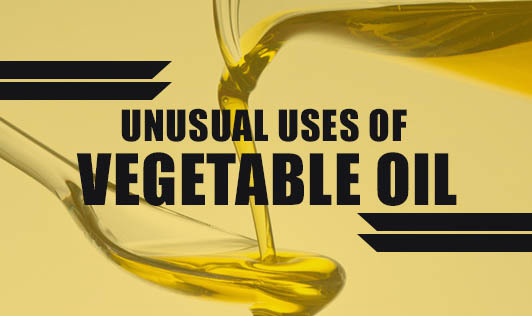 There are many more unusual uses of vegetable oil. You could become more economical by replacing vegetable oil with those expensive skin care products.